The bleeding of patients, practised since Babylonian times probably represents the most widespread application of ‘quackery’ in the history of medicine. Rooted in one of the oldest theories of medicine aimed at restoring the balance of the four humours, it nevertheless continued long after this theory was discredited. In Europe the practice was rife from the 17th through to the late 19th century and still remains in use in some third world countries. During the latter half of this period physicians bled their patients aggressively. The complexity of humoral theory was such that doctors could promote their own rationale for bleeding in almost any circumstances. 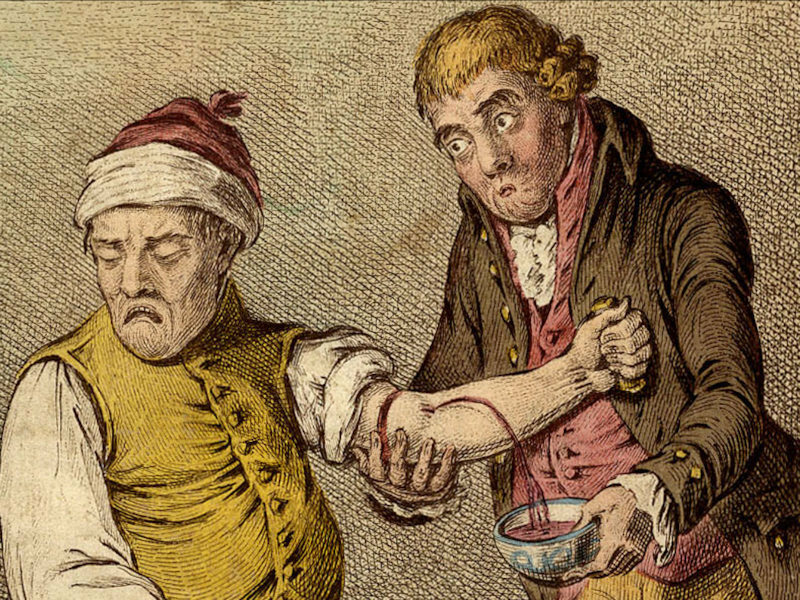 And bleed they did, to the extent that the practice became ‘de rigueur’ and was considered a panacea for a host of ailments ranging from fever to madness – even haemorrhage. Evidence based medicine was less the order of the day than anecdote, and there was no shortage of stories chronicling miraculous recoveries after ‘breathing a vein’.